On Tuesday, December 1, from 2-3 pm, we’ll be on air with Charlie Huisken (of This Ain’t the Rosedale Library fame) to talk about our chapbooks and small-pressing-it. Tune your radio in to CKLN at 88.1 FM, or listen online at www.ckln.fm! That’s right – we’re pleased to announce that our chapbooks are now available for your purchasing pleasure at http://www.etsy.com/shop/TERUBooks! See? Look how easy we just made impulse buying. We’re looking out for you. They’re almost here! Tell your friends! Our lovely books will be making their debut at the Ottawa Small Press Fair on Saturday, November 28 at the Jack Purcell Community Centre (320 Jack Purcell Lane, just off of Elgin, at Gilmour). We’ll be there from 12-5. Will you? Like a beacon in the cold, quiet world of chapbook publishing, The Chapbook Review is, according to their website, “A monthly online literary journal focused on the critical examination of the venerable chapbook: slim, soft-cover books, usually inexpensively produced and independently published.” This description of the chapbook warms our lonely hearts. Check out the latest issue, featuring the Chapbook Publishers Roundtable 2009, here. In other news, we just received a batch of absolutely beautiful chapbooks from the new-ish Ottawa-based Apt. 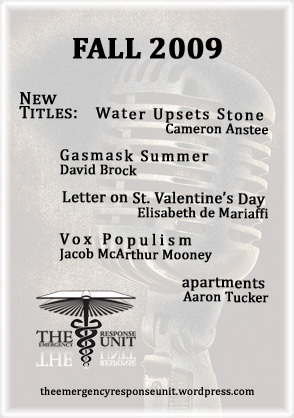 9 Press, run by our very own Cameron Anstee; we’re publishing his chapbook, Water Upsets Stone, any day now. It too will be beautiful. All right. Back to the grindstone.